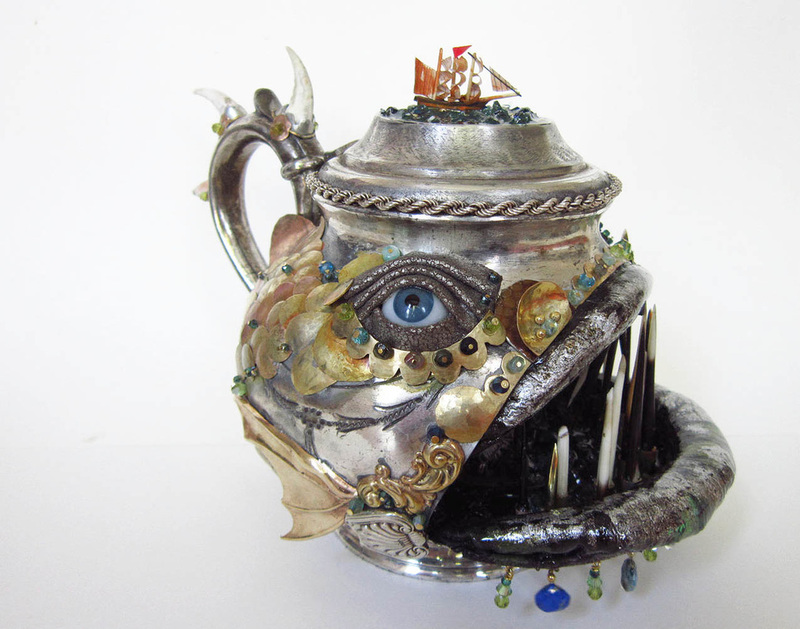 This intricate and highly decorated piece was inspired by a fantasy deep sea creature called The Avanc, in a book I was reading at the time of making – gigantic, slow and ancient. 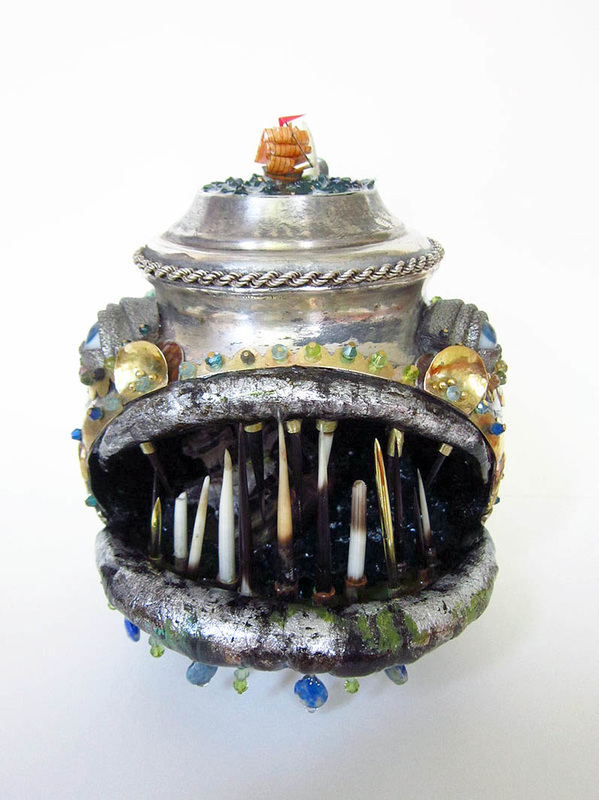 I began to develop a picture based on the grotesque Angler fish. 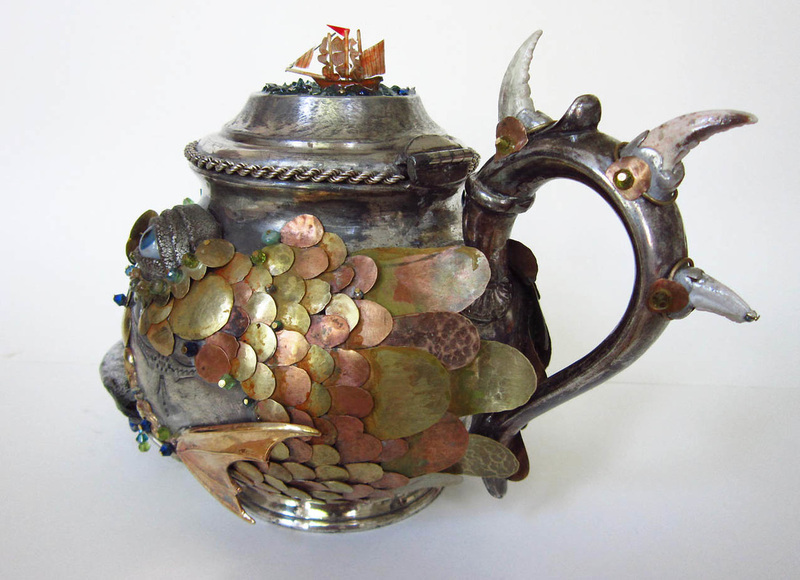 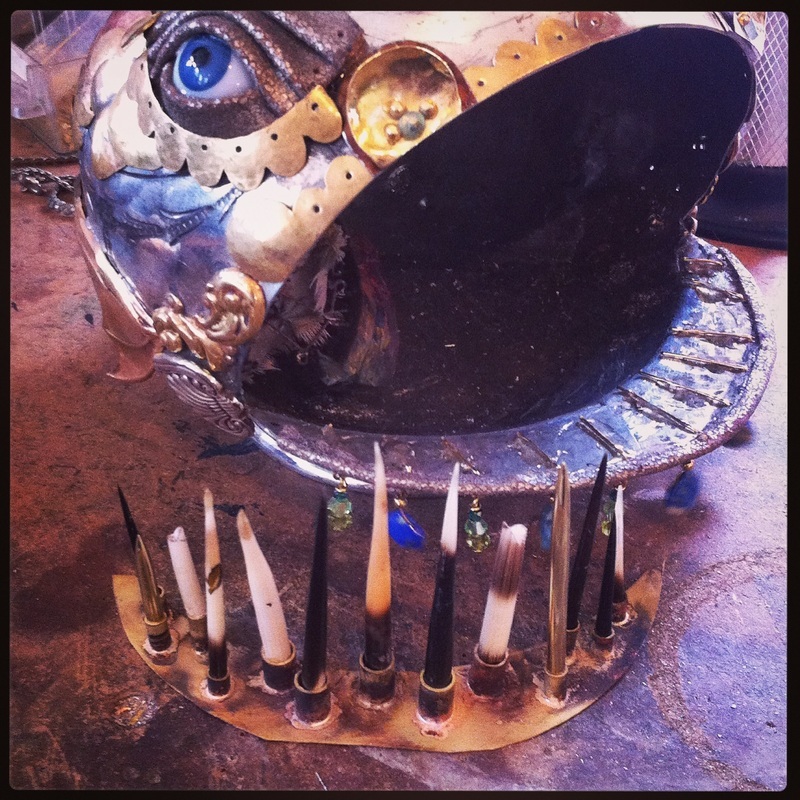 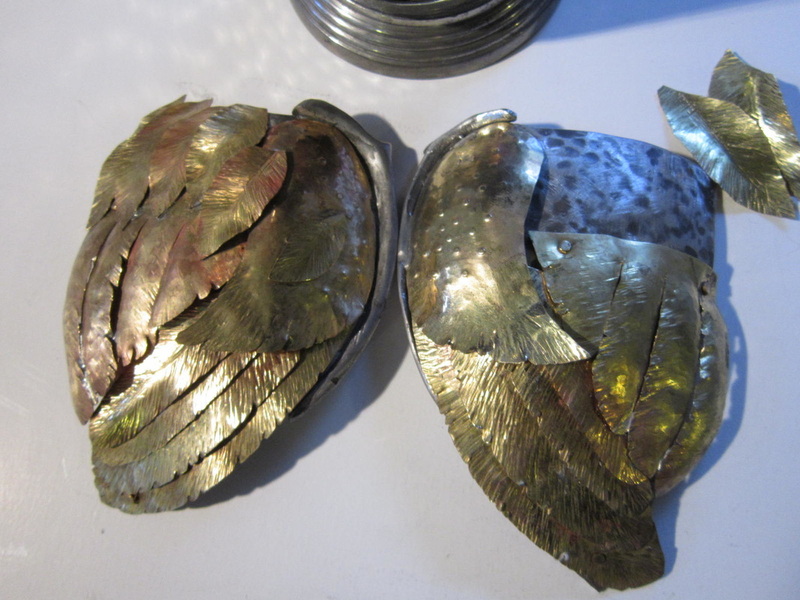 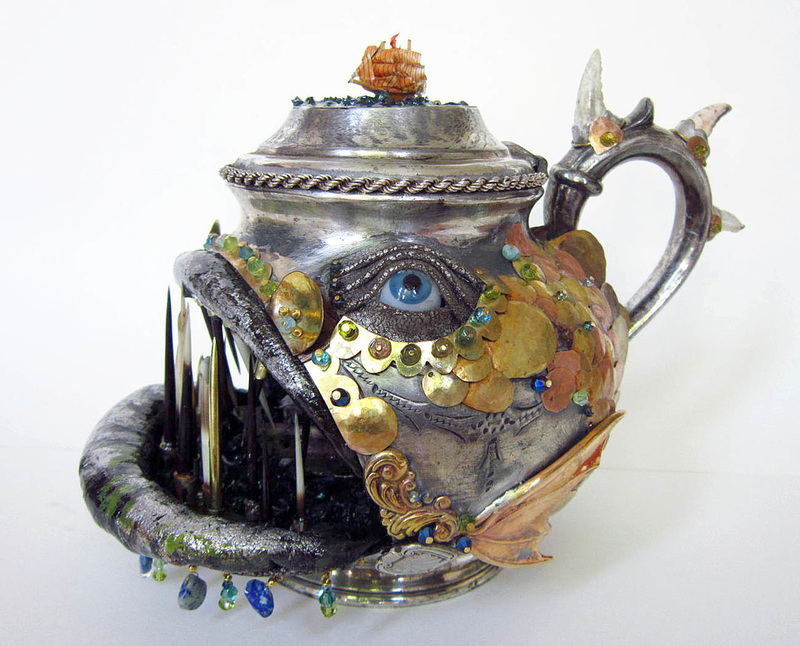 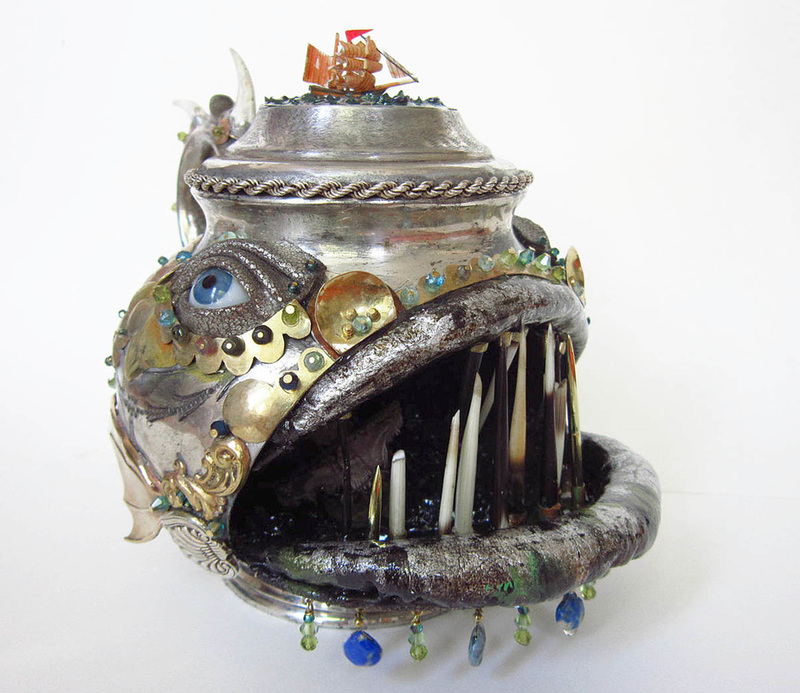 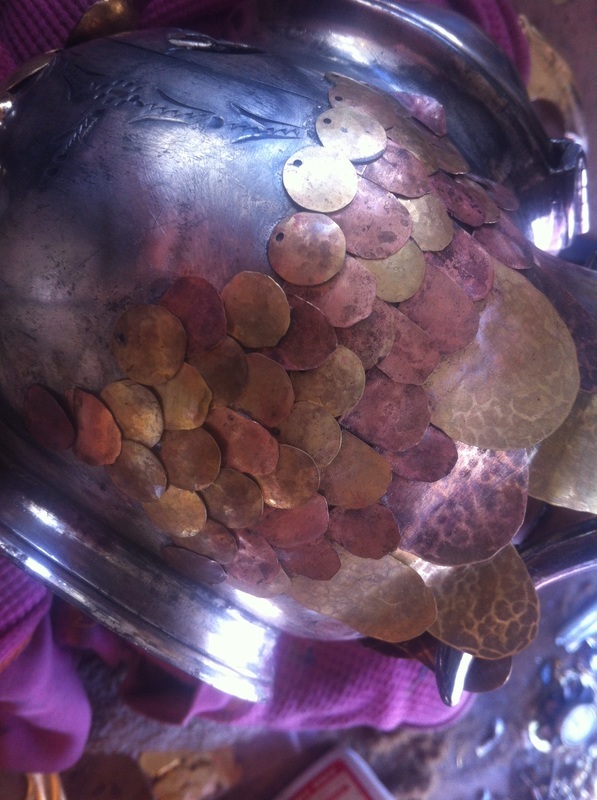 Mixing imagery from my imagination with various sea creatures, and researching decorative armour, scales and reptilian creatures made in metal I began to form my own creature. 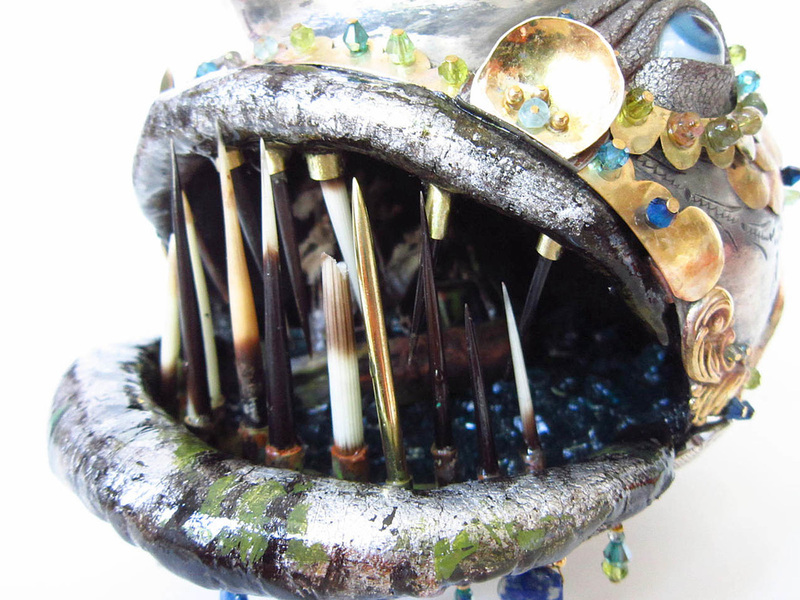 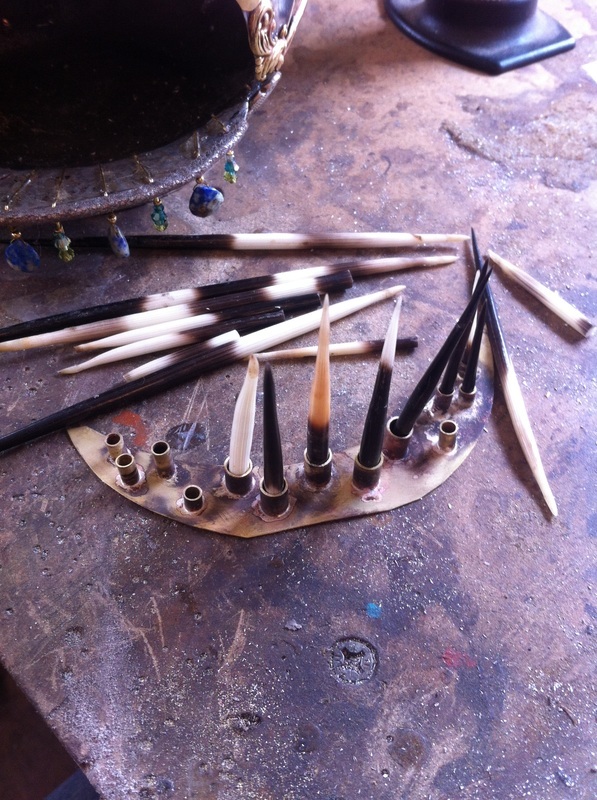 I gathered natural materials collected previously – porcupine quills from a forest walk in Tuscany, crab claws from the beach here in Brighton, leather from an old handbag, semi precious stones and Victorian hand blown, glass dolls eyes. 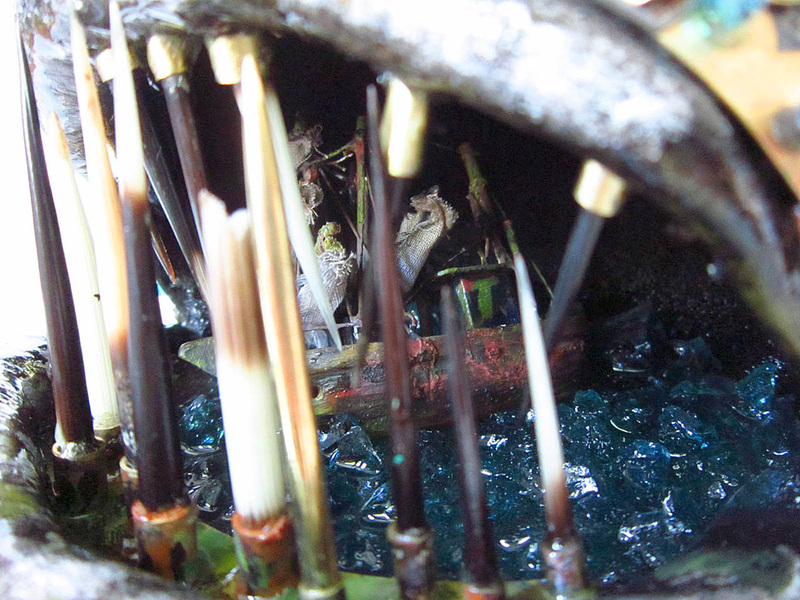 I used shattered blue glass – taken from a cooled down furnace while I was studying glass blowing – for the sea inside his mouth, and above his head. 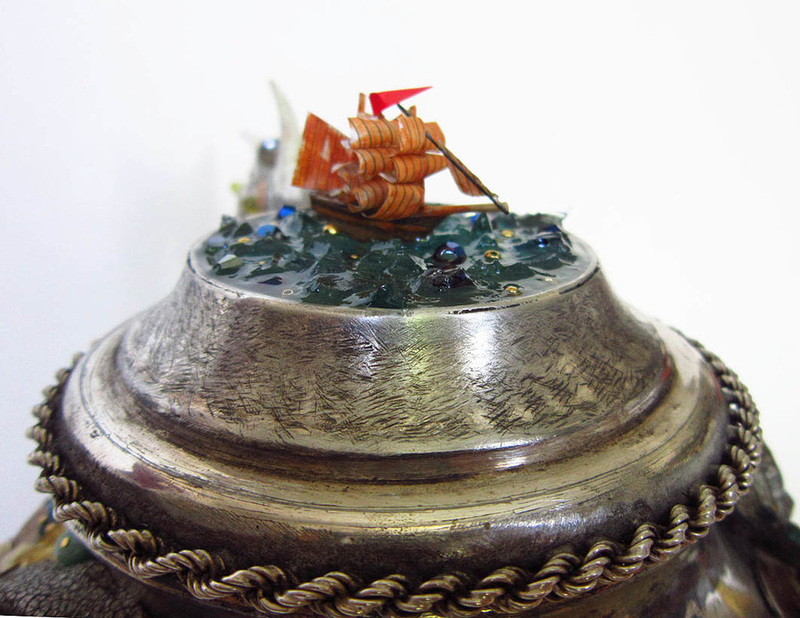 The tiny ships were found at our local flea market, once in bottles, and all the brass and copper is reclaimed and was once another, discarded object. 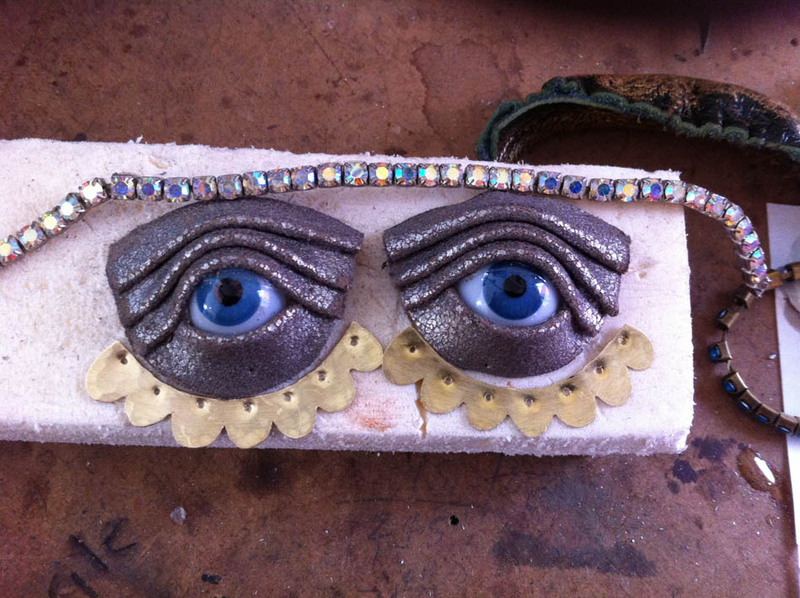 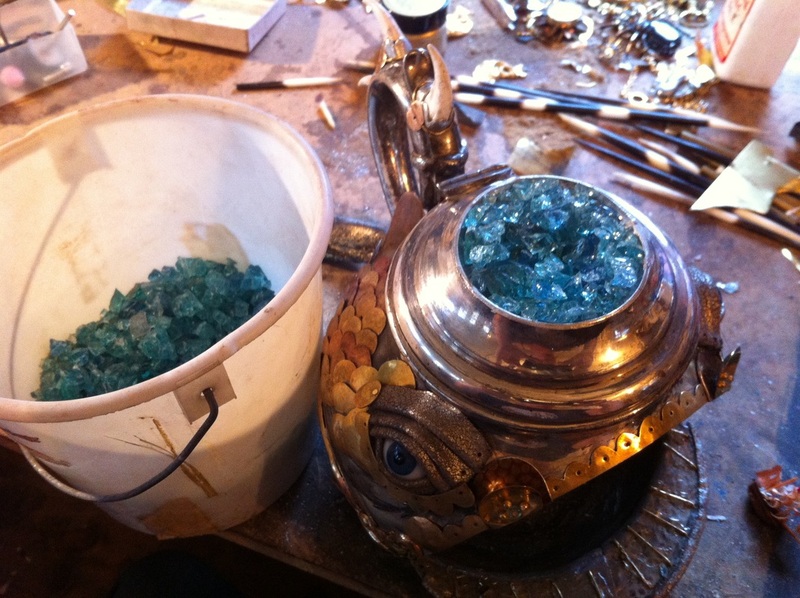 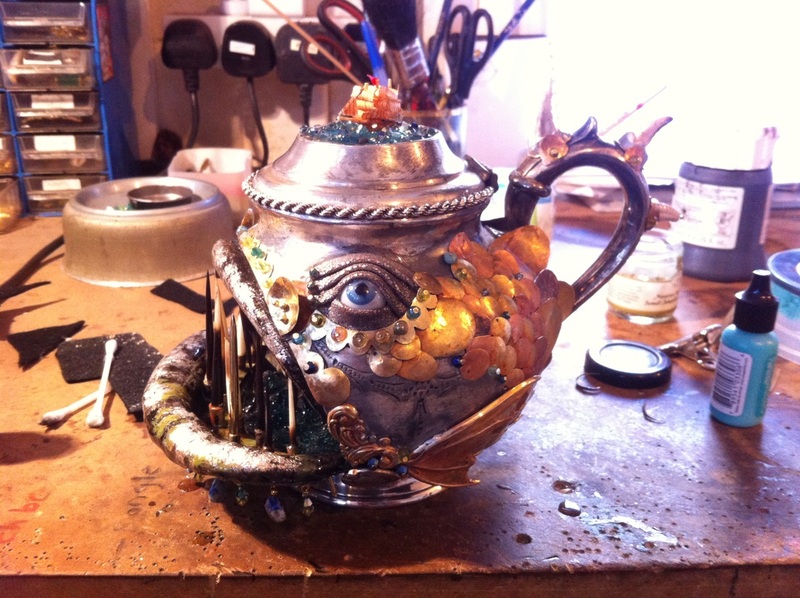 I worked intuitively with this piece, adding decoration as I went, and finishing with semi precious stones, glass beads and a metal paint patina. 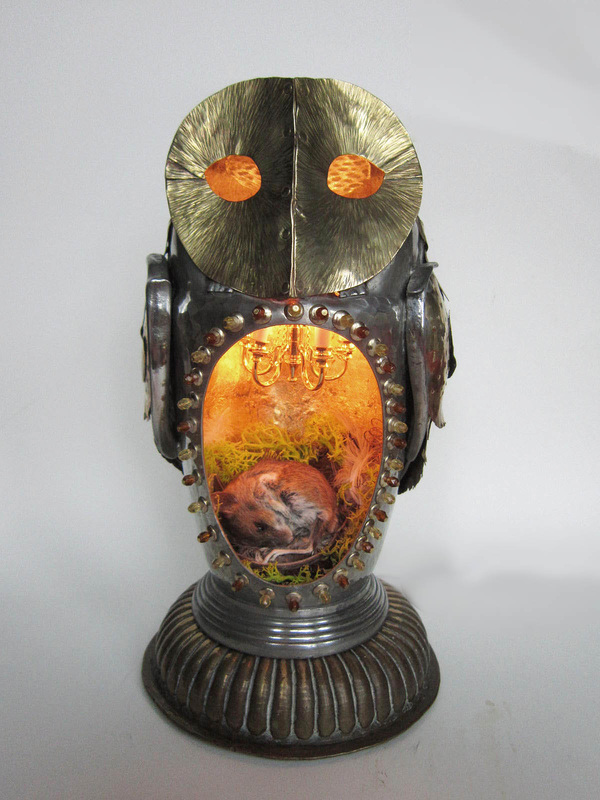 This piece now has a new home with a deep sea diver. 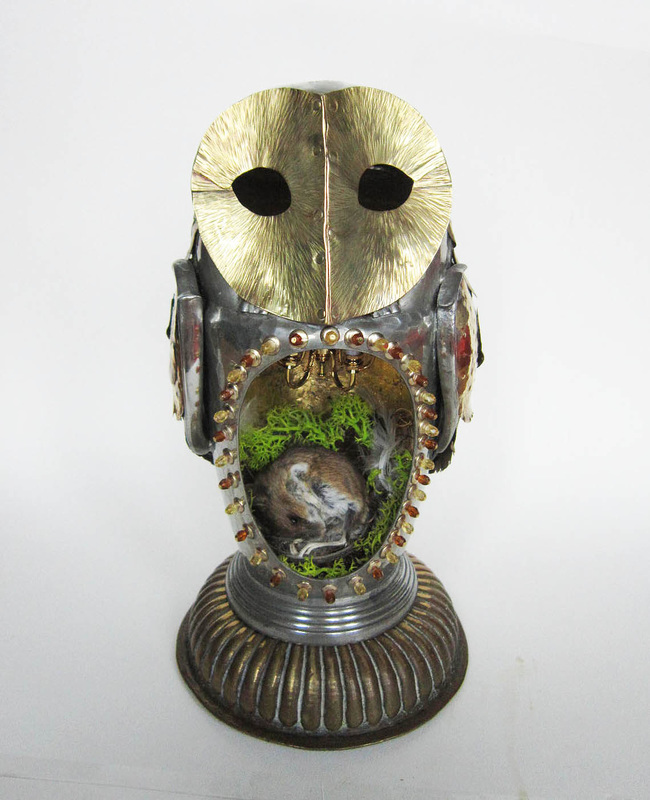 This sculpture is a modern reliquary – a place created to house something personal. 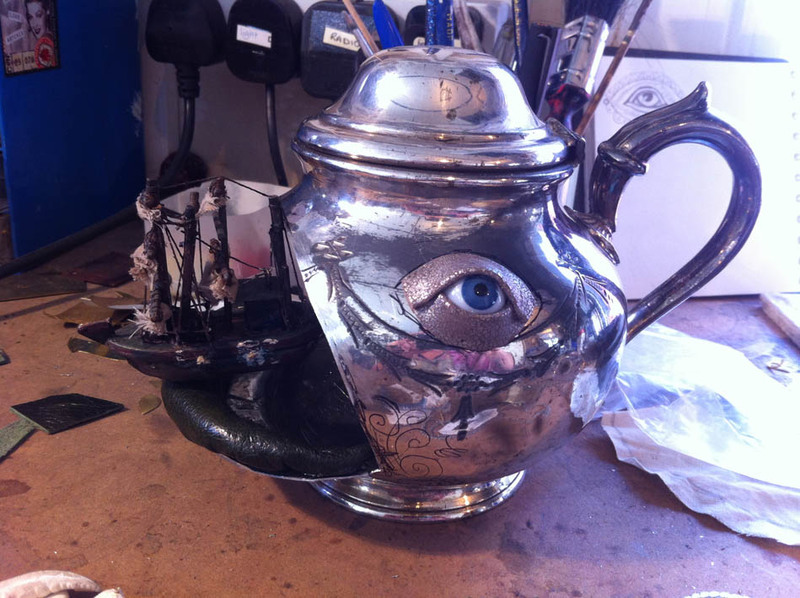 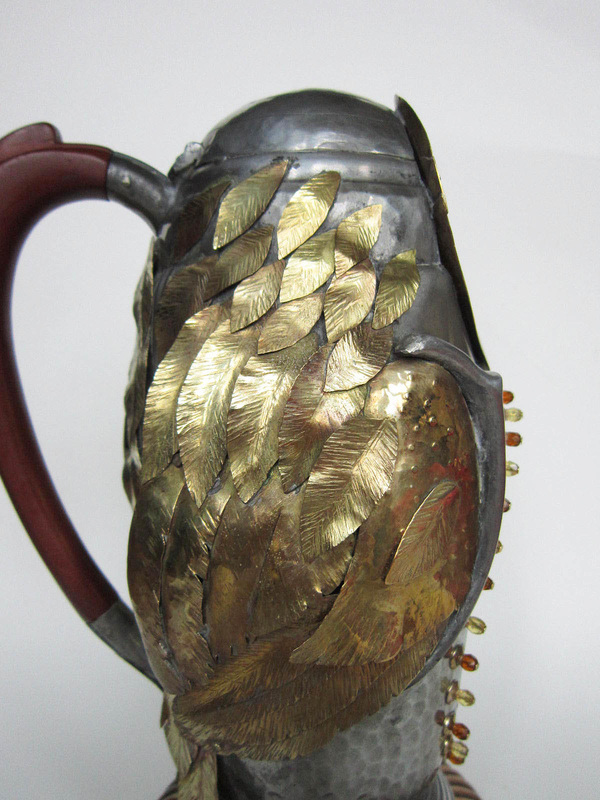 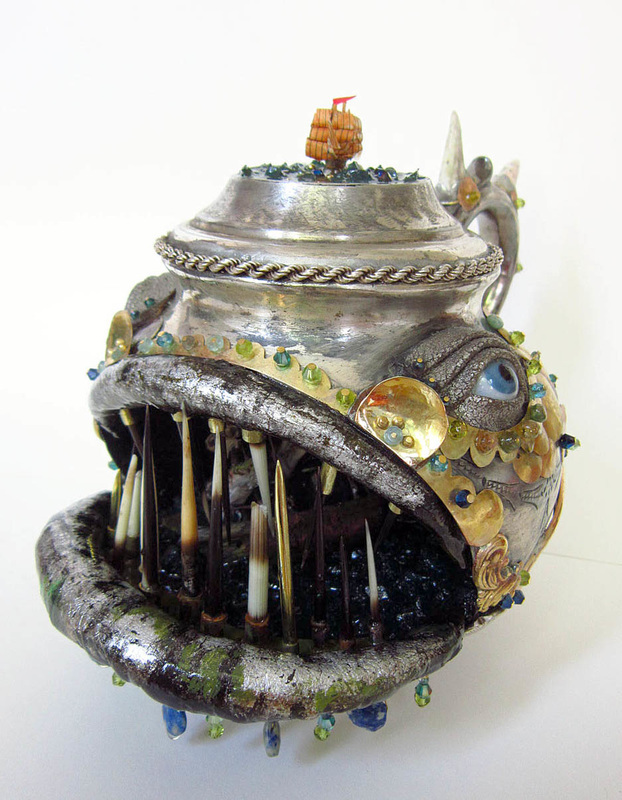 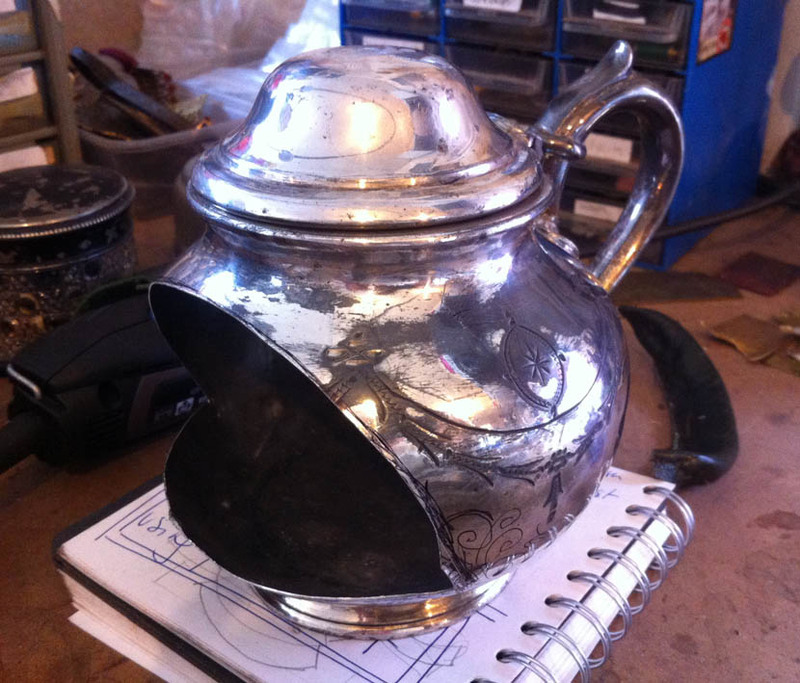 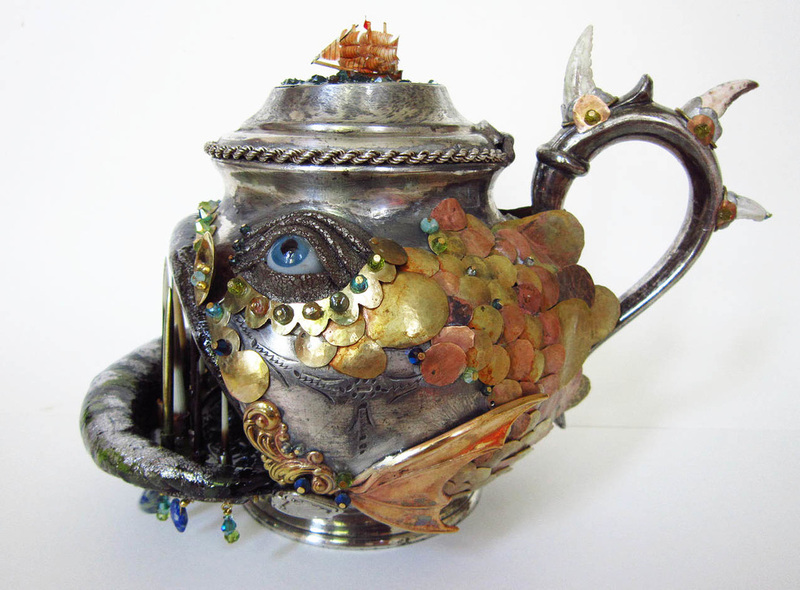 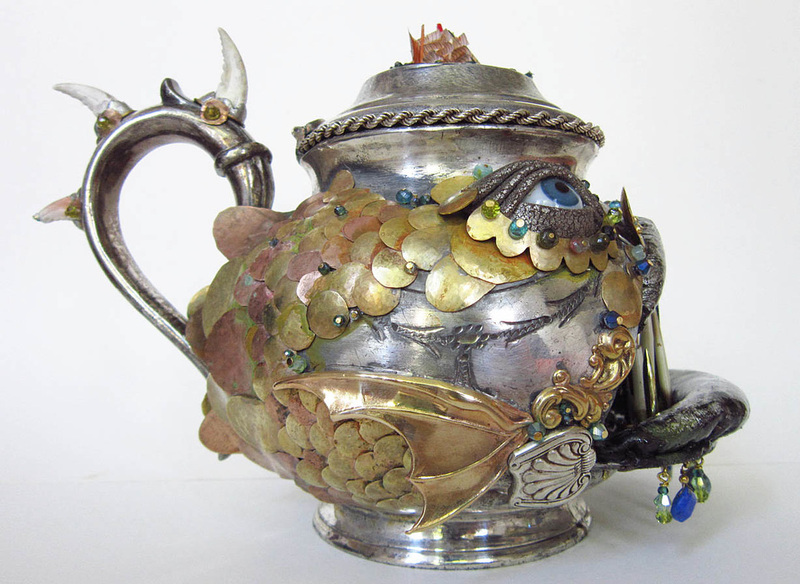 Initially I simply wanted to make an owl, however, as I worked on this antique coffee pot it shifted and became a more personal work, I loved his face and I wanted to house something inside him, he looked empty. 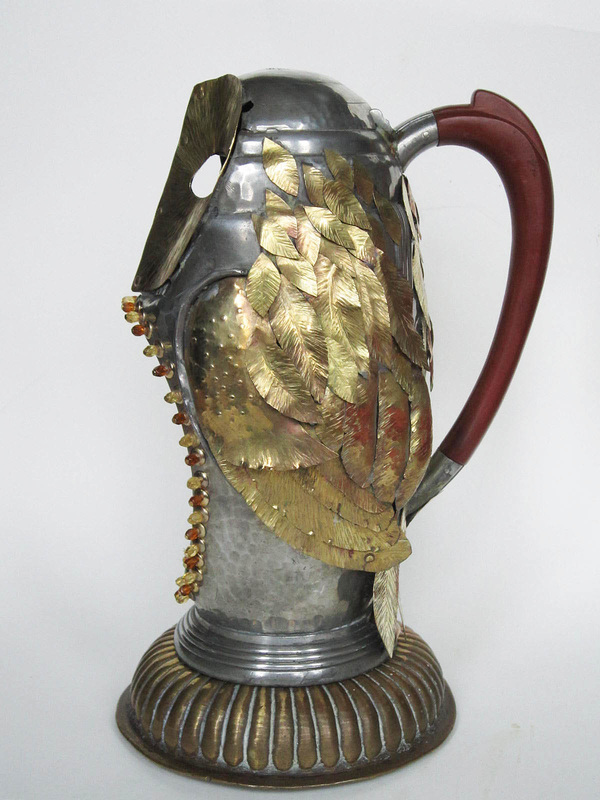 The concept of a medieval reliquary is a beautiful and rich piece of work holds an item of religious importance, or more personally it becomes a place to house peoples’ hopes and emotions. 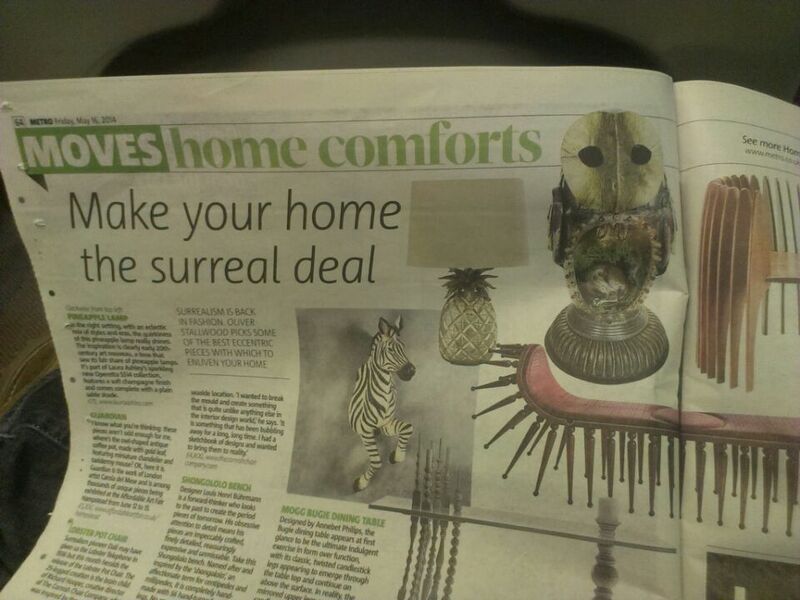 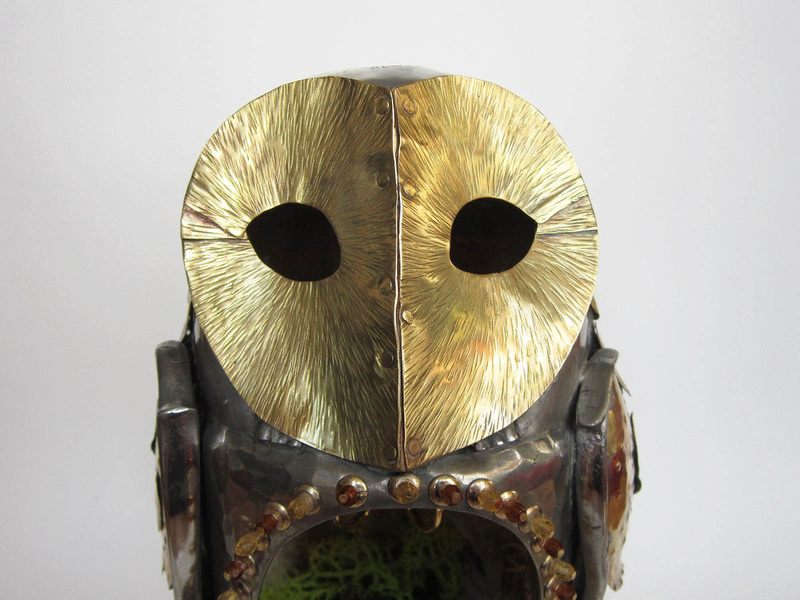 In a modern context I felt I could symbolically house a person’s hopes in this friendly owl. 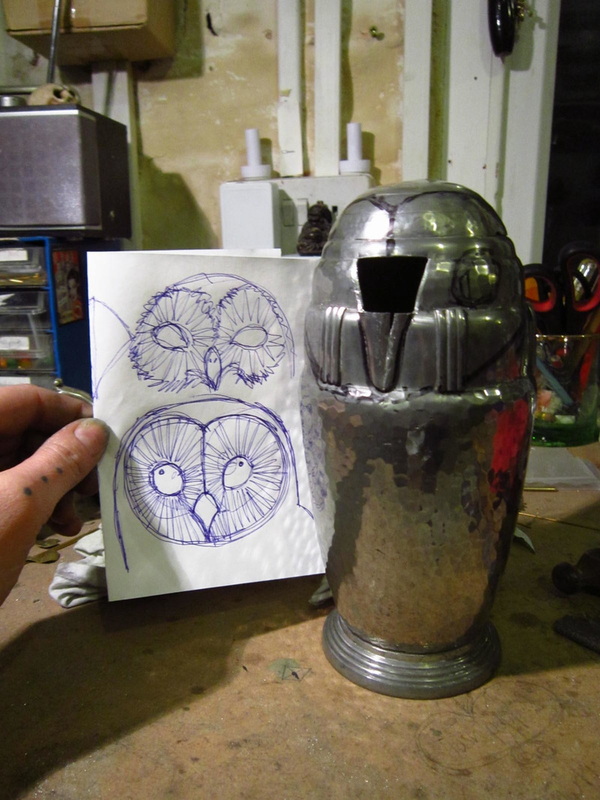 So eventually, the Owl has become a Guardian, and I am the mouse sleeping peacefully inside. 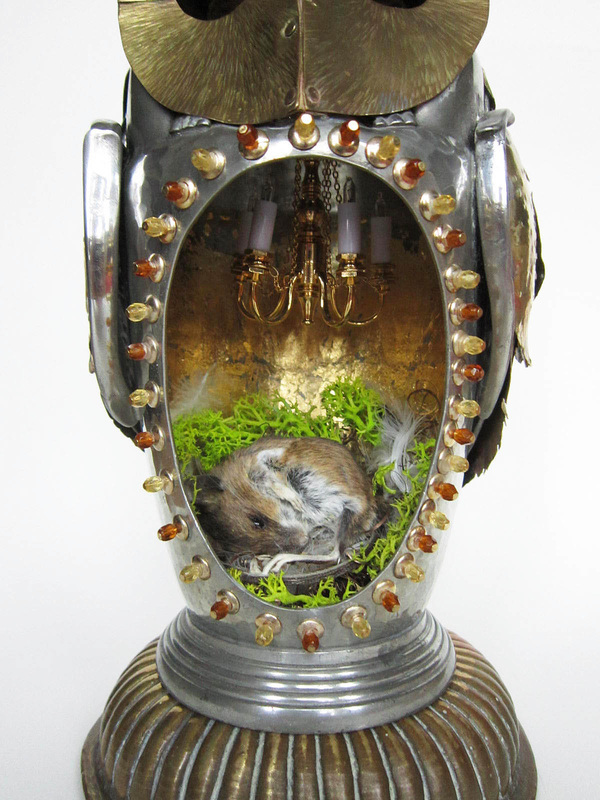 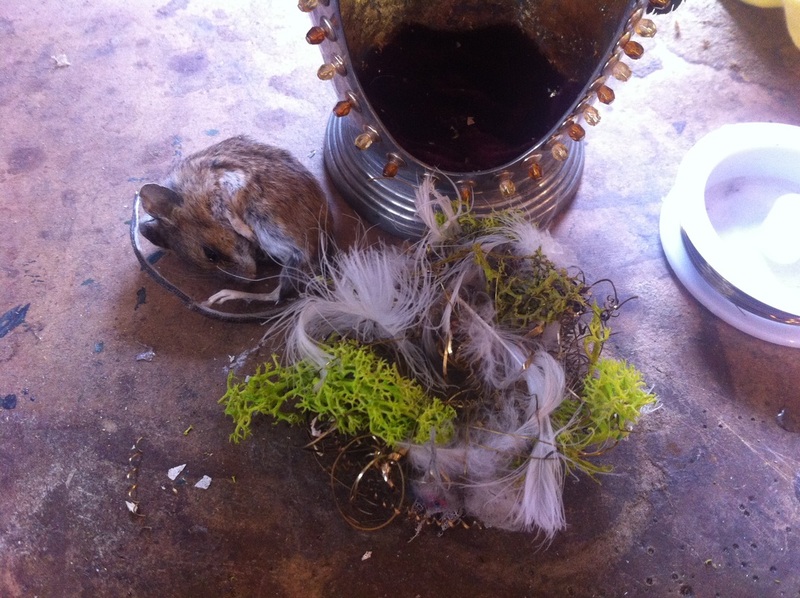 All the materials used are reclaimed, the cat brought the mouse in and the nest materials were gathered from the street outside my studio. 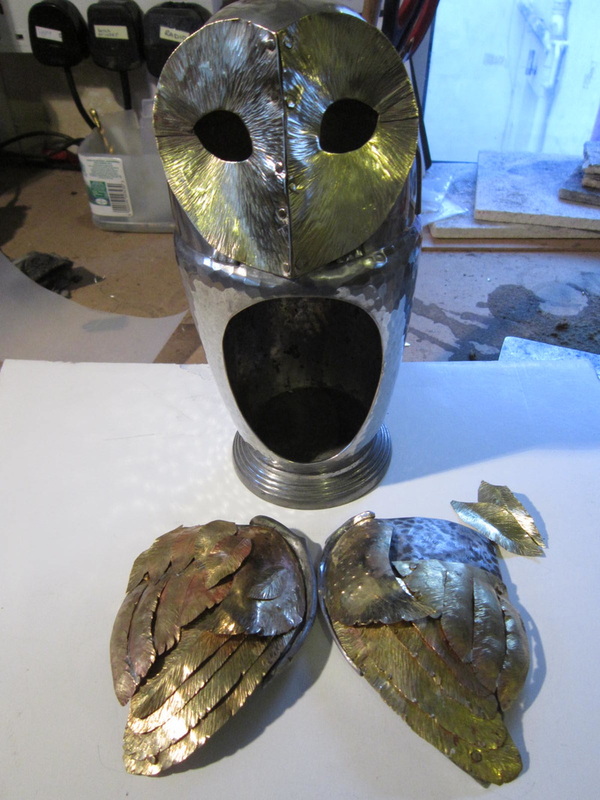 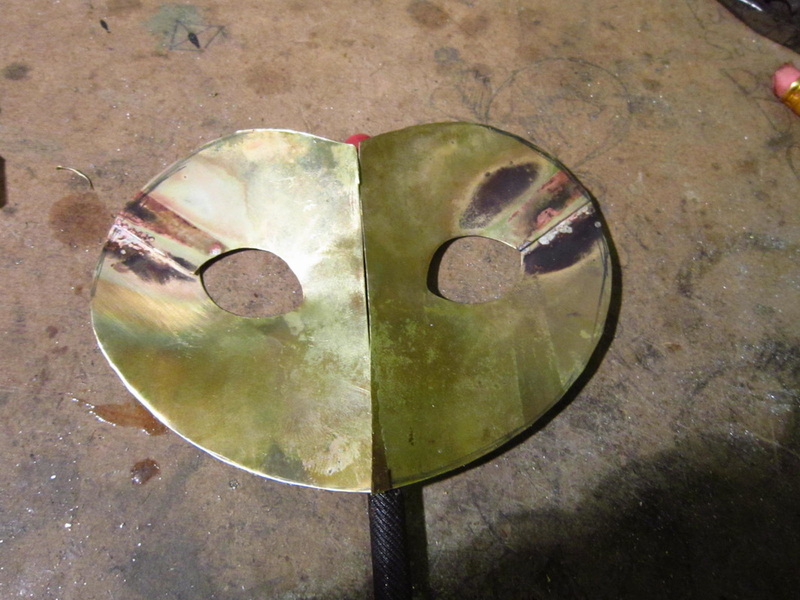 The interior of the owl is lined with gold leaf. 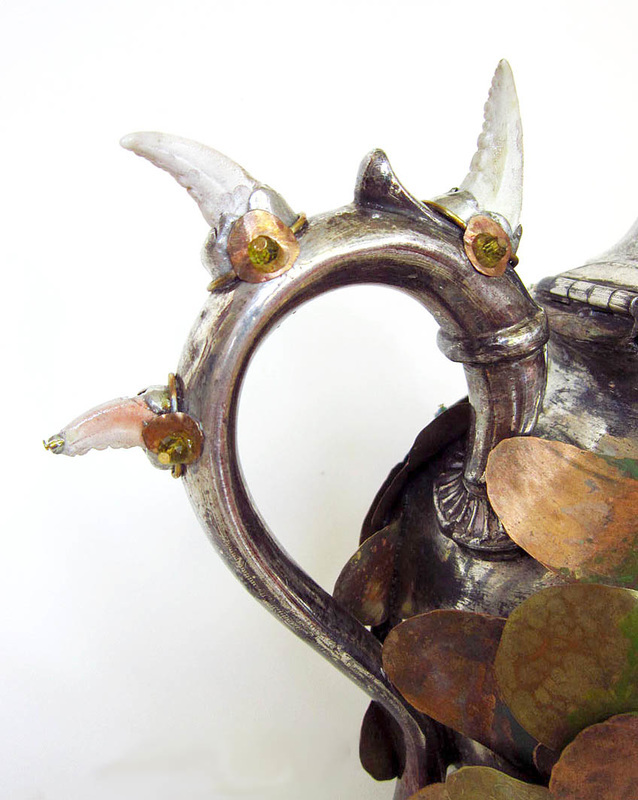 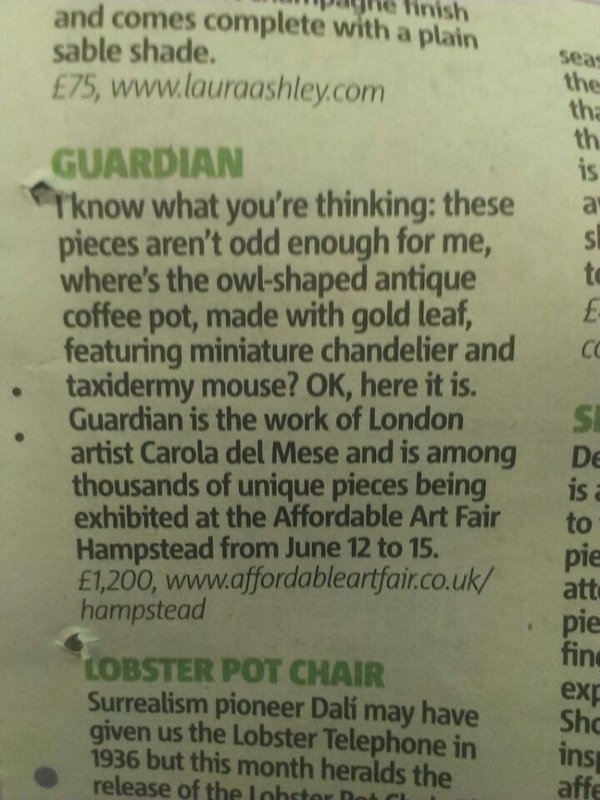 The wings are made using the sugar bowl which was part of the coffee pot set, as is the head of the owl.